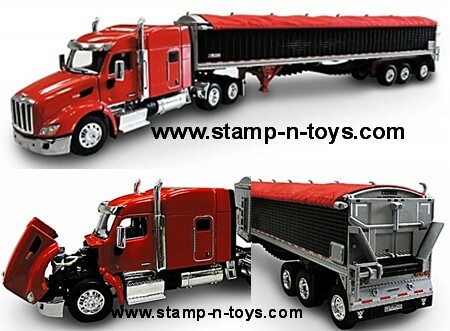 DieCast Promotions, 1/64 scale Kenworth T-800 with 38″ sleeper pulling a Wilson Pacesetter Hopper Bottom Grain Trailer. The KW has wide construction steer tires & Rims, Metal Hump Rear fenders, CAT yellow engine, and 252″ wheelbase. Trailer has chrome ends. Other features as shown. Outstanding detail and very authentic. Comes new in the box.